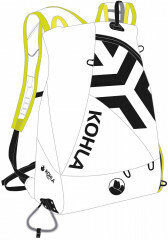 The Kohla Space Pack combines one of the fastest race-pack layouts with the wonder material known as Dyneema*. Strong, light, waterproof, you name it. 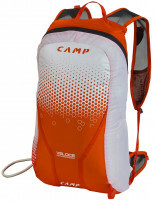 The Space Pack carries a spritely 20-liters of gear split between a main compartment and a crampon pouch. The main zipper houses all your safety gear, a hydration bladder, snow study equipment, and maybe a puffy jacket or extra gloves. The crampon compartment is easily accessible via a Velcro door and is perfect for extra gear that needs to be accessed quickly. 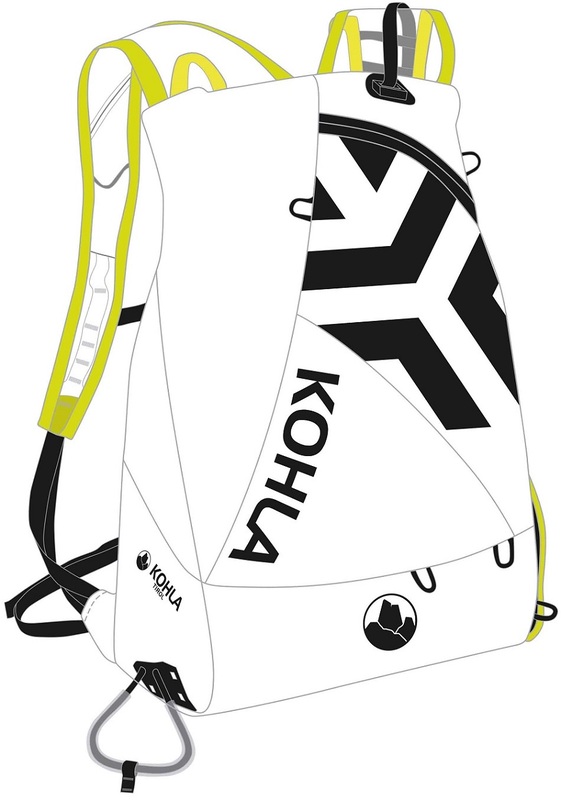 If you are hard on gear, want an ultralight race pack, or just like the properties of Dyneema, the Kohla Space pack is perfect for you. Comprised of Dyneema Black, a fiber that’s 15x stronger than steel and 40% stronger than Aramid. Race-style diagonal ski carry is the fastest way to the top. Velcro door offers quick access to the crampon compartment. Hydration hose gets routed through the left shoulder strap internally for a few inches of insulation from the elements. *If you are unfamiliar, Dyneema is a wonder-fabric that is over 10x stronger than steel and nearly 50% stronger than Aramid. It also happens to be waterproof and incredibly light. 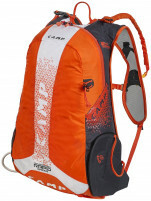 Backpackers have been using it for years on tarps, packs, clothing, and various knick-knacks. If there is one person that can out-weight-weenie a skimo racer, it’s an ultralight backpacker. From cutting toothbrushes in half (if you even pack a toothbrush), to sleeping right on the ground sans sleeping pad, fast-packers take their weight reduction to the next level. Up until now, Dyneema packs adopted for skiing have been buckets with inefficient ski carry systems. The Space Pack finally brings all the benefits of Dyneema to the race world with an efficient layout and speed ski-carry. It's a unicorn, of sorts.